5,5 - 5.........Lump von Hagenstolz. “A very short red male bred in Holland. He had a very masculine head and a good balanced body with a firm topline, excellent tailset and good angulation. He won the Bundessieger title in 1976 and was a German and International Champion. In 1977 he gained his DV-Sieger title. It is hard to believe that this super dog was only graded 'Very Good' (for conformation) when he took his ZTP test. 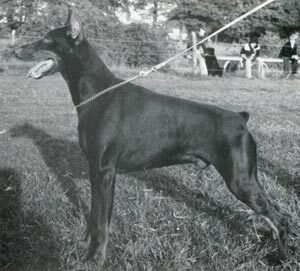 His Qualities as a stud dog were not recognized in his homeland which was a great pity for the breed. Cito: SchH 1 plus winner of an Italian show championship. He is sire of the di Campovalano “E” litter (Elisir) and von der Scheppacher Mühle “B” litter (Bianca). Caienna: winner of an Italian show championship. She is dam of the di Campovalano “E, I, O, Z” litters (Elisir).